If you don't want to have a good position, you can go out and sell tofu. 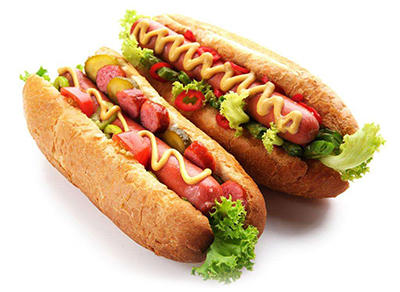 [Laughter] Not in America maybe, but you can sell hot dogs - vegetarian hot dogs. Are you allowed in America to sell hot dogs on the street? [Audience: Yes] Then why don't you do that? If people know how tasty vegetarian hot dogs are, they will come for more. It's very easy. They sell vegetarian hot dogs in the market, or you can import them from Formosa. One kind of Formosan hot dog is very beautiful. I make sandwiches with it all the time. You can make it with soft American hot dog bread, or take French bread, and slit and butter it. Boil the hot dog; you don't have to grill it. Have a pot of water and always have hot dogs swimming inside. Then pick it out, put it in the slit bread, buttered already, and put some tomato, sliced cucumber, coriander leaves (cilantro), and then some salt, pepper, ketchup, and what else? - mustard and Maggi sauce. Beautiful! You can sell coffee or Coca Cola to go with it. That's beautiful! I made that all the time before, and I liked it very much. You can sell them very cheaply in front of movies, the university or schools. You'll make money in no time. All you need is very little capital and a small car, and there are a lot of things you can do. Some people always look for big business, and that's why they are miserable. You can just sell necessary items, the ones that people cannot go without, and sell them in a crowded place with a small budget. That will make more money than a big restaurant, believe me, because you don't have anything to worry about. No big taxes to pay, no personnel, no tablecloths, and things like waiting on people and people sitting there for a long time. At hot dog stands or in places like McDonald's, they come and go, come and go, and they make a lot of money. That is why the McDonald's kinds of restaurants prosper. You can sell things like vegetarian chicken, hamburgers and all that. Why do you have to cling to fame, name, and a big position? Big businesses have a lot of headaches and stress; they break up your relationships, break up your marriage. Sometimes your children leave you, your wife hates you, because you are always in conferences and doing business, and you don't take care of them, etc. This is just a joke, a suggestion, but you have a thousand ideas about what to do. Or you can sell things like woolen scarves in winter in front of a big place. Some people forget them, and when they see the colorful scarves, they will buy one or two. These are cheap and quick. Or sell socks and these kinds of convenient things, like hats that cover the ears. Those kinds of hats, you can make yourself, or buy and sell. In summer, you can sell something else and in winter, you can sell something different, some small things, if it's allowed. That's very simple.